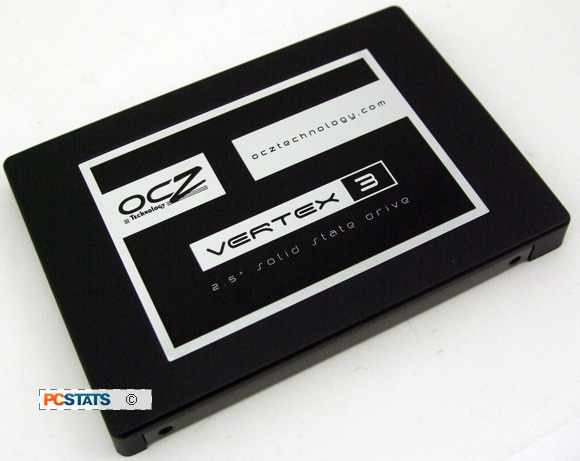 Abstract: On the test bench today is a speedy little black box called the OCZ Vertex 3. If you haven't spoiled your computer yet with a Solid State Drive (SSD) yet, now's the time -- SSDs have never been more affordable! On the test bench today is a speedy little black box called the OCZ Vertex 3. If you haven't spoiled your computer yet with a Solid State Drive (SSD) yet, now's the time -- SSDs have never been more affordable! The Vertex 3 is a great little 240GB SSD and just the right capacity to install Windows 7 along with a bunch of programs onto, without worrying for drive space. Since this SSD is rated for 6Gb/s SATA III, you'll find it quicker than first generation SATA II drives and light years faster than a standard mechanical hard drive when it comes to booting up or launching programs. Hard drives are great for storing massive amounts of data, don't get me wrong there, it's just when it comes to your PCs operating system, a Solid State Drive increases responsiveness dramatically. Okay, let's talk numbers -- OCZ's Vertex 3 240GB SSD is rated for a maximum Read speed of 510MB/s and maximum Write speed of 280MB/s in AS SSD. That's quick. 4KB random read is pegged at 53,500 IOPS, 4KB random write 56,000 IOPS. Under the cover you'll find 24nm Multi-Level Cell (MLC) NAND Flash and the popular LSI SandForce SF-2281 controller. 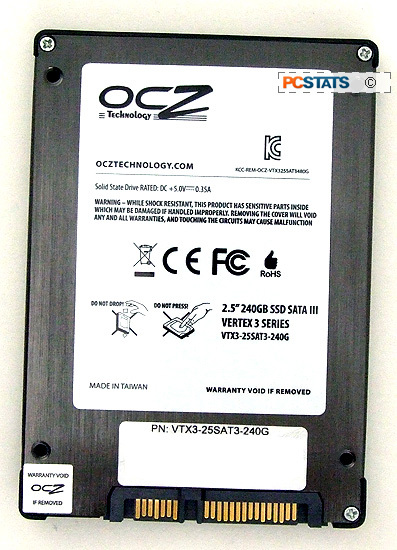 The OCZ VTX3-25SAT3-240G is a 2.5" drive, 9.3mm thick and it ships with a 3.5" metal adaptor plate so it can more easily be installed into desktop computer systems. This SSD supports TRIM, SMART and NCQ. The 240GB Vertex 3 SSD retails for around $189 USD/CDN, putting the cost of storage at about $0.78/GB. According to OCZ, the VTX3-25SAT3-240G SSD draws ~3W peak power, 1.65W while idle. 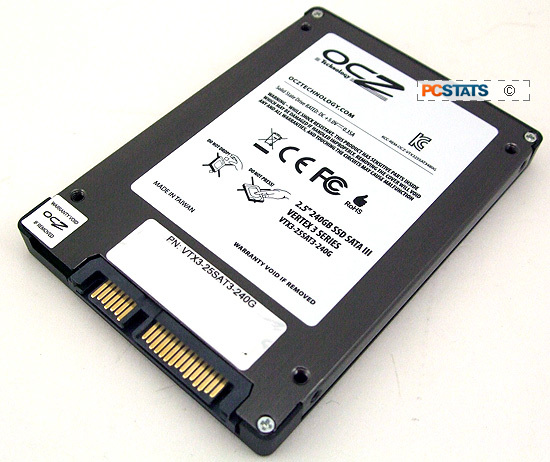 Physically, the OCZ Vertex 3 240GB SSD is housed in a simple die cast aluminum chassis which is painted black. There's a logo sticker on one side and detailed bar codes / serial numbers on the opposite. The SSD measures 2.5" wide and 9.3mm thick. Since PCSTATS purchased this unit for a system in the labs we will not Void the warranty for a peak under the cover. OCZ spec the VTX3-25SAT3-240G out with 24nm MLC NAND flash memory chips. 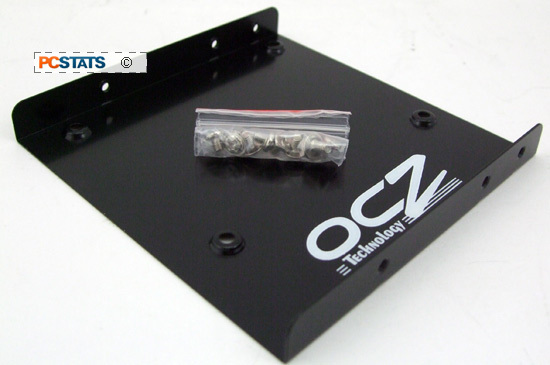 A 3.5" adaptor plate is included to mount the SSD in desktop HDD trays. As every SSD review ever written will tell you, the onboard controller is what makes or breaks an SSD as it's responsible for balancing bandwidth, latency and reliability. The OCZ Vertex 3 is built around the LSI SandForce SF-2281 Flash Storage Processor - the same controller used with SanDisk's Extreme which PCSTATS cracked open here . This controller supports a host interface of 6Gb/s SATA III and includes a range of flash management tools under the umbrella term 'DuraClass'. Like most SSD controllers, LSI's SandForce SF-2281 features DuraWrite technology and wear leveling and monitoring, which distributes write operations across all the MLC NAND memory. This feature prevents any one flash cell from being written to and worn down more than the others since current flash cells are capable of a finite number of write cycles, extending the life of the drive. The controller performs garbage collection automatically to improve the endurance of flash memory over time. The SF-2281 controller also supports Flash Error Correction and Redundant Array of Independent Silicon Elements (RAISE) -- RAISE provides RAID-like protection and recovery from potentially catastrophic flash block failures without the penalty of a write overhead. The OCZ VTX3-25SAT3-240G supports S.M.A.R.T. diagnostic tools which indicate when the SSD is reaching the end of its lifespan, Native Command Queing (NCQ) and TRIM. TRIM allows the controller to safely and quickly overwrite data blocks that have been flagged for deletion, rather than going through the slower process of reading them into memory, checking and modifying the data, and writing it back to flash memory. A 3-year warranty backs up the 240GB OCZ Vertex 3 and the manufacturer claims it will hold up to at least 2,000,000 hours of sustained use. Let's see how this SSD handles itself on the PCSTATS test bench, next. The details of how the 240GB OCZ Vertex 3 SSD (model: VTX3-25SATA3-240G) test system was configured for benchmarking; the specific hardware, software drivers, operating system and benchmark versions is indicated below. Please take a moment to look over PCSTATS test system configurations before moving on to the individual benchmark results on the next page.